This wonderful southwestern soup makes around 8 quarts, enough to feed a crowd. Like most soups, it's better the second day. In a large pot, saute bacon until brown. Pour off fat and add the butter. Add the onions and thyme and cook until onions are translucent. Add the bell pepper. Add flour, cook, stirring for four minutes over low heat to eliminate the raw taste of flour. Add the chicken stock, potatoes, poblanos and corn. Slowly bring to a boil while stirring until thick. Simmer 10 minutes. Add the bacon and cream. Taste and season with salt, pepper, cilantro, and reserved bacon. 6 Tablespoons of Better Than Bouillon Chicken Base dissolved in a gallon of warm water (use filtered or spring water if available) will give you a gallon of chicken stock. Fresh sweet corn is the best. Corn that is not fresh or has been exposed to heat prior to cooking can get starchy and lose its sweet flavor. this was fantastic! 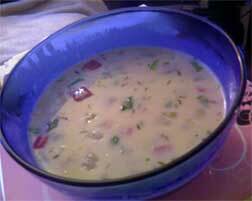 like a clam chowder consistency - w/great southwest flavors and sweet corn! yum! !